Richard I of England (8 September 1157 – 6 April 1199) was the king of England from 1189 to 1199. He is sometimes called Richard the Lionheart. 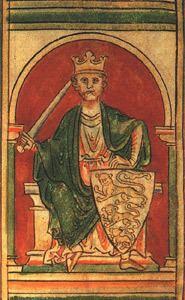 Richard was the son of Henry II of England and Eleanor of Aquitaine. As the third son and not expected to inherit the throne, he was a replacement child. In 1168 he became Duke of Aquitaine. Richard was one of the leaders of the Third Crusade against Saladin, which never actually succeeded. During his journey, he conquered Sicily and Cyprus. He fought in the Battle of Acre and the Battle of Arsuf. In the end, as he was unable to win back Jerusalem from the Muslims, he decided to return home to England. On his way back from the Crusade, Richard was captured by the Austrian Duke, Leopold I. The English people had to pay a huge ransom to set him free. He was considered a very brave and noble king, but he did not spend a lot of time in England - only six months of his eleven-year reign were spent in his country. He died after being shot with a crossbow while besieging a castle in Limousin. His remains were buried at different places. His body was buried at Fontevraud Abbey near Saumur in France, as are his father and mother. His internal organs were buried at Chalus, near Limoges in central France. His heart was buried in the Notre Dame Cathedral at Rouen. It was found in 1838 and was examined by scientists in 2012. They did tests for poisons, as one medieval story claimed Richard had died from a poisoned arrow. There is no evidence to support this idea, and he probably died from gangrene or septicaemia from the arrow wound. Richard was succeeded by his younger brother, John. ↑ Adam Taylor (8 September 2014). "'A spare to the heir': The weirdness of being a royal sibling". The Washington Pose. Retrieved 19 October 2014. ↑ 2.0 2.1 2.2 2.3 2.4 2.5 Morelle, Rebecca (28 February 2013). "Richard the Lionheart's mummified heart analysed". bbc.co.uk. Retrieved 1 March 2013. This page was last changed on 15 March 2019, at 10:00.